Every Summer, the stores start getting flooded with different types of water safety devices for kids. They've got life jackets, personal flotation devices (PFDs), puddle jumpers, inflatable arm bands, training vests, etc. Which ones do you need and what are the differences between them? In this post, I'm going to list all the different types of water safety devices and the appropriate times you would want to use them. There are many flotation devices on the market, but I'm only going to discuss the main ones we see as parents. According to the Canadian Red Cross, "A Canadian approved standard life jacket, when worn properly, is designed to turn an unconscious person from face down to face up in the water, allowing them to breathe....standard life jackets must be orange, yellow or red, and have a whistle attached." This is the main difference between a life jacket and a personal flotation device. They both look similar, which can be confusing to a lot of parents. Approved life jackets are recommended for any type of offshore boating situation, rafting, etc where a rescue may be delayed. 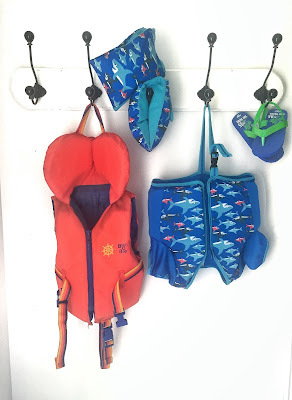 From my research, I would also recommend these life jackets for children while river tubing, or any situation where your child may be swept away from you if they fall into the water. A life jacket is NOT a replacement for adult supervision. A personal flotation device, or PFD is designed to keep you afloat while in the water, but does not flip you onto your back like a life jacket does. This means, that if knocked unconscious, they will not turn you over allowing you to breathe. They are typically less bulky than life jackets and come in a variety of colors. These often come in fun colors for children, sometimes with familiar characters on them. Many parents confuse life jackets with PFDs, but it's important to know the difference. These devices are for near shore situations, where a rescue would most likely happen quickly. This includes situations where you are swimming close to shore in calm water, supervised swimming in a pool, etc. There are NOT ideal for any type of off shore rough water situation, boating, etc. Swim vests, or swim jackets are a buoyant flotation device that is worn just like a zip up jacket. They are often made with the same material as a swim suit, and can be worn over or in place of a swim suit top. They have a strap that goes between the legs of the child and adjusts so you can make sure it is secure. My 3 year old has a swim vest, and we love it because it is less bulky than a PFD, but still provides great support in the water. Like a PFD, these are ONLY to be worn in near shore, calm water situations, swimming pools, etc and with adult supervision. These tend to keep the child upright in the water, but if your child happens to become horizontal, these will NOT flip your child onto their back. These are always a HOT item in mom groups every Summer. Everyone wants to know where they can buy puddle jumpers. But what's so awesome about them? Puddle jumpers are okay for children learning to swim, because they are not as bulky as a life jacket or PFD, but provide better flotation than inflatable arm bands. Many parents like puddle jumpers because they allow the child to move more freely than the devices listed above, while still providing buoyancy. Although many parents use these in pools, if your child is in swimming lessons, the instructor will most likely discourage the use of any flotation device, because they say it doesn't help them learn to actually float and swim on their own. I think these are great for shallow swimming pools, and for allowing your child to gain more confidence in the water. A puddle jumper is not appropriate for unsupervised swimming, open water boating, rough water, strong tides, etc. It should be used in calm close to shore water, or in a pool with adult supervision. These have many names, but we all know what they are- those annoying arm bands that you have to inflate before use (not too much or it's too tight, not too little or it wont float ugh). We have these because I bought them on sale last fall, but I cant see us using them a lot. They are known to come off easily, slip down the arm, etc. They are really only appropriate for a child who is past the puddle jumper/swim vest stage. 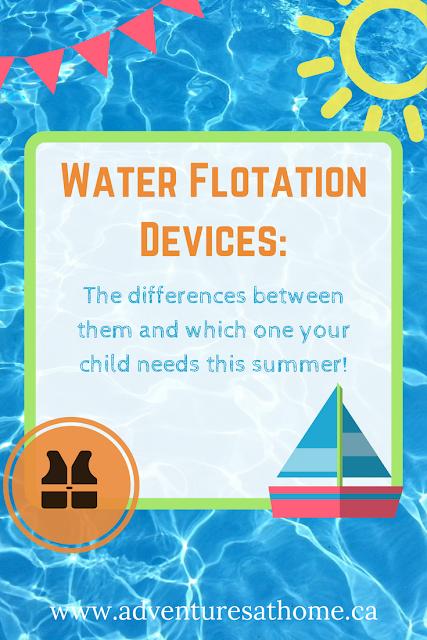 Like the above devices, they need to be used with adult supervision, close to shore or in a swimming pool. To check the buoyancy of your flotation device before using it. These devices will not last forever. Check for any rips, tears, fraying, etc. Make sure all zippers and buckles work. Make sure you purchase the right sized flotation device for your child's weight and age. Remember that these devices are not a replacement for adult supervision. An adult should be with a child at all times in the water. Remember that while boating you must have the life jacket ON the child and fastened at all times. Don't expect to be able to fasten the life jacket when you're already in the water. Please comment below and let me know if there's any information or tips I missed and should add! I think water safety is so important and want to be as accurate as possible! This is soooo important, and a great read! This is great information! I was just preparing to buy my daughter a swim vest and this is really good to know! We love our son's Puddle Jumper! He's currently in swim classes and I didn't think about how his Puddle Jumper might interfere with him learning to swim. It's been a great safety measure when we swim in my Mom's pool! I don't think I realized there were so many different names and kinds! Great post! Right now, I don't use any flotation devices with our 2-year-old. His only water exposure is in a pool while holding onto me, though. I would definitely feel differently if we were swimming in the ocean, a lake, etc. I've been researching some different options because I won't be able to hold him in the water when Baby #2 comes along here in a few weeks!